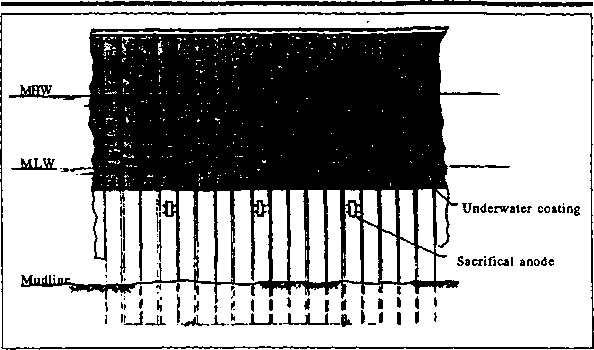 The ultimate consumption of the oxygen is realized within the mitochondrion which is the intracellular organelle responsible for oxidation of end-products of energy substrates (Figure 1.2-1). Indeed, 90% of the oxygen is consumed in the mitochondrion. End-products of energetical substances originating from lipids, carbohydrates and proteins enter the mitochodrion. These substrates, after passing the Krebs' cycle, furnish the carriers (NADH, FADH2) which shuttle electrons and protons to the respiratory chain of the inner mitochondrial membrane. It is at this level that e- and H+ are transported from NADH and FADH2 to acceptors of the electron transport chain. The process, named oxidative phosphorylation, occurs by means of five multiprotein complexes, known as complexes I to V. Complexes I to IV are involved in electron transfer to oxygen, the final electron acceptor. Complexes I, III, and IV translocate protons across the inner membrane, rising the electrochemical proton gradient (proton motive force) which drives the synthesis of ATP from ADP and Pi by complex V. These five multiproteins of the respiratory chain are: NADH CoQ oxidoreductase, succinate CoQ oxidoreductase, CoQ-Cytc oxidoreductase, Cytc oxidase ( also called Cyt a3) and ATP synthase. Cytc oxidase is notably responsible for the final supply of 4 H+ and 4 e - to molecular O2 to form a molecule of water (H2O). These enzymatic complexes are coupled with the system which pumps protons towards the intermembranous space, establishing a proton gradient which in turn is used by ATP synthases to produce ATP (adenosine triphosphate), the universal source of energy within the cell (see figure 1.2-1). It is noteworthy for understanding the energetic role of oxygen to compare the energy balance of glucose catabolism between different conditions of oxygen availability. The degradation of glucose (glycolysis) starts first in the cytoplasm, with the goal of forming two molecules of pyruvate. The net energy balance of this first stage, which does not require oxygen, is two ATP and two NADH molecules. In presence of oxygen, pyruvate (3C-molecule) penetrates inside the mitochondrion for its decarboxylation to acetyl-CoA (2C-molecule) and the production of NADH. It is at this stage that acetate enters the Krebs cycle to produce two supplementary CO2, three NADH molecules and one FADH2 molecule per cycle. 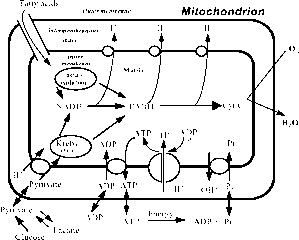 The energy yield of this first stage is six ATP for one glucose (four from glycolysis + two from the Krebs cycle). However, the highest energy production is established by NADH and FADH2, which enter the respiratory chain where four H+ and four e - are transferred on a molecule of O2 to form two H2O. The electron transport chain, by oxidizing the NADH and FADH2, produces energy by transferring H+ into the intermembranous space; this electrochemical proton gradient creates a proton force which makes them return to the mitochondrial matrix by means of ATP synthases coupling this proton translocation with ATP production. It is at the level of the respiratory chain that the energy production is most profitable because each NADH produces three ATP and each FADH2 produces two ATP. Under aerobic conditions, one molecule of glucose generates 36 molecules of ATP. In oxygen deprivation, glucose produces two pyruvate molecules and two NADH which bypass the mitochondrion to regenerate the NAD+. NADH is then regenerated into NAD+ by transforming pyruvate to lactate. This anaerobic glycolysis, apart from the fact that it produces some lactic acid with well known effects, yields two ATP for one molecule of glucose (produced during the initial glycolysis). This is better than nothing, but markedly less than the 36 ATP obtained under aerobic conditions. This student's description illustrates how much the energy metabolism is dependent on a correct supply of oxygen.